Q Does this fixture come with a ceiling plate? A The Visual Comfort E.F. Chapman Mykonos 8 Light Chandelier CHC1561AB comes with a 6" octogonal ceiling plate. A The Visual Comfort E.F. Chapman Mykonos 8 Light Chandelier CHC1561AB does not come in a smaller size. Q On the Visual Comfort site, this is shown with shades. Does it come with shades? A The shades are sold seperately on the Visual Comfort E.F. Chapman Mykonos 8 Light Chandelier CHC1561AB. A The Visual Comfort E.F. Chapman Mykonos 8 Light Chandelier CHC1561AB is not available in a smaller size. Q Is there a lacquer coating to protect the antique burnish finish? Recently installed the fixture and there are finger prints that do not wipe off easily. A The Visual Comfort E.F. Chapman Mykonos 8 Light Chandelier CHC1561AB does not have a lacquer finish on it. 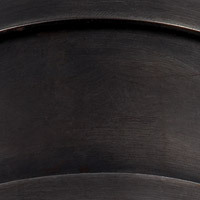 It is a Natural hand rubbed brass which is a living finish and will darken over time. 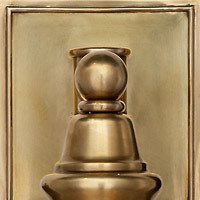 It was suggested by Visual Comfort, to remove the fingerprints with a very slight amount of Brasso, brass cleaner, but do not over use, as it could remover the antiquing. Q Does this chandelier come in a larger size? A Yes, the Visual Comfort E.F. Chapman Mykonos 8 Light Chandelier CHC1561AB is available in a larger 8 Light Chandelier that is 37" wide and 38.75" high CHC1562AB. 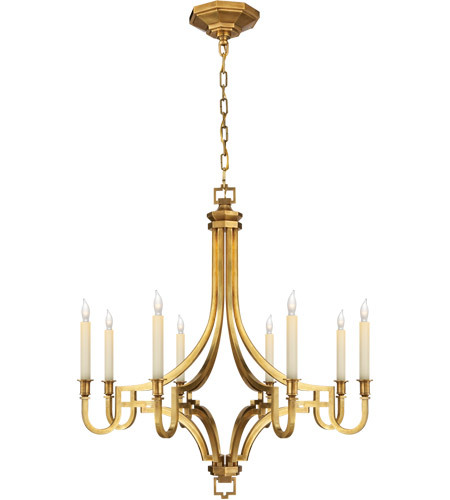 Q What is the height of this chandelier (CHC1561AB) including the canopy? A The Visual Comfort E. F. Chapman Mykonos Chandelier CHC1561AB has an overall height of 104" which includes the item itself at 29", then 6 feet of chain and the canopy from the top ring to the top of the canopy attaching to the ceiling is 3".